Following RSPB reports that hen harrier nests have been abandoned in Lancashire, Sir Ian Botham is reported to be offering a £10,000 reward to anyone prepared to rescue abandoned eggs and release them back into the wild. Clearly people monitoring harrier nests would have had to act before the eggs cooled so it’s too late to do anything for the clutches abandoned a few weeks ago. But could it work in future? Have chicks been reared in captivity before? Yes. In 1973-77 in North America, conservationists managed to produce more than 300 peregrines from eggs1. By 1979 more than 30 species of raptor, from falcons to large vultures, had been raised in captivity. Today bird conservation programmes are increasingly focused around captive propagation and release for supplementing dwindling populations2. Does this extend to collecting eggs from wild birds? Yes. This has been undertaken for several species around the world. In 1994 French (love it, blame the French) conservationists3 started collecting Montagu’s harrier eggs from nests located in arable fields just before harvest. The details, which were published in 2000, strongly suggest there are no grounds for concern over behavioural issues after the fledged chicks were released back into the wild. Could this work be undertaken while investigations continue into missing adults? Yes. It’s hard to think of a reason why it could not be undertaken alongside any ongoing criminal investigation by the police. Surely birds’ eggs are protected? Yes. This type of conservation activity would have to be authorised by Natural England. They would carefully review the facts before issuing a licence. Under the EU Birds Directive they can grant permission for intervention on conservation grounds. Such a licence would need to be granted in advance of the harrier nesting season. Could the eggs be moved fast enough? This would need careful planning. Remote cameras continually monitor each nest so it should be possible to asses when a male is late retuning to the nest. As soon as the female leaves the nest observers could move quickly, with portable incubator boxes and switch the eggs with ‘dummies’. If the adults were to return the real eggs could be replaced. Either way the eggs are not lost. Should there have been such a contingency plan ready? Yes. One report4 suggests 70% of hen harrier nesting attempts failed on grouse moors due to adults going missing. Having a contingency plan in place would ensure the eggs hatch and the progeny are returned to the wild. With the hen harrier population so low, it appears odd to repeatedly allow clutches of 5-8 eggs to fail. Whilst those on the ground continue their investigation into the missing birds, perhaps it is also time to start planning conservation contingencies before any more nests are abandoned. All the remaining eggs have a chance – we should prepare contingencies now. It is vital that all those with responsibility for land management in regions where Hen Harrier (and other birds of prey), choose to nest, ensure that their environmental management regimes and standing orders they issue to their staff, stay strictly within the law. 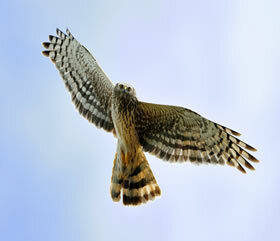 The killing of Hen Harrier and other birds of prey is illegal. Those that flout the law are criminals and must be pursued as such. It is only a matter of time until these outdated and abhorrent acts are confined to history. Do you feel that by offering a financial incentive to parties to remove the eggs of adult hen harriers that have mysteriously vanished, you might run the risk of incentivising the killing of adult hen harriers, sure in the knowledge that their broods will then be removed too? We're more interested in the science behind the possibility of organisations salvaging the eggs. We're not suggesting rewards should be put in place that would encourage all and sundry to retrieve eggs. Offering £10,000 pounds to organisations that remove clutches when adult hen harriers 'vanish' doesn't appear entirely sensible. Perhaps the funds might be better spent protecting adult hen harriers as the venture away from their nests in search of food? Of course this is possible if risky, not very practical and no long term solution to the shame of continued illegal persecution of birds of prey around our grouse moors. Conveniently, Mr Botham's proposal is consistent with his current theme of denigrating the work of conservation organisations such as the RSPB and lauding the efforts of the shooting community. Unfortunately, for him and those who consider his proposal reasonable and sensible, his support for The You Forgot the Birds unscientific and un-evidenced nonsense and drivel completely undermines his credibility. His money would be far better spent helping to catch those that continue to break the law and his time better spent supporting campaigns within the shooting community to stamp out illegal persecution of hen harriers and other birds of prey.